Traditional interviews—when you ask candidates about their skills and experience to see if they’re a fit for the job—have been the industry standard for decades. They can range from in-person vs. phone to one-on-one vs. panel to structured vs. unstructured questions. And, these methods aren’t going anywhere anytime soon. Traditional interviews also leave room for bias, take a lot of time, and rely on the right interview questions being asked in order to get a clear picture of a candidate. Thankfully, new interviewing tools and techniques have entered the scene and are helping to solve these problems. High-tech tools like Koru and Pymetrics draw on neuroscience to assess candidates’ soft skills, like grit, teamwork, and flexibility—factors that really do predict job performance. With 20-minute surveys and revealing mini-games, these technologies help recruiters get super-individualized insights into a ton of candidates. It’s not just the unique insights that these soft skills assessments offer—it’s the fact that you can get those insights quickly and at scale. Think about it: it’s way faster to have 100 people take a 20-minute test than it is to personally interview each one. That speed and scale also makes it much easier to expand your reach and draw on talent pools with more diverse backgrounds and experiences. And the talent enjoys taking the assessments, too: Citi says nearly 90% of candidates gave the experience a positive rating. Traditional interviews might give you a decent idea of how candidates present themselves, think on their feet, and answer questions. But unless the role is “professional interviewee,” you don’t get to see how they’ll actually perform on the job. That’s exactly why job auditions are gaining steam. There’s no single way to do job auditions: some companies do hackathons, others bring candidates in for a full day of work, and others even hire candidates for a multi-week trial period. By throwing the talent in the deep end and seeing how they swim, you get a realistic sense of their skills. The super awkward candidate who made a less-than-stellar impression might be a savant who does the job 10x better than the super polished candidate—but you’ll only find out if you really put them to the test. Job auditions don’t just benefit the employer: candidates get a real sense of the day-to-day job, so they know exactly what they’re signing up for. That’s bound to help your attrition rate, while providing a more satisfying candidate experience. Low-key, casual interviews may not be a high-tech innovation or a particularly new practice, but it is a rapidly rising trend. Companies in Denmark have long enjoyed interviews in casual settings. Charles Schwab’s CEO likes to have dinner with candidates to see how they act in the real world—he’ll even have the waiters purposely mess up their order to see how candidates respond. While these used to be outliers, today more than half of all recruiters and hiring managers see the usefulness of less formal interviews. It puts everyone at ease, allows candidates to show more of their personality, and gives a great impression of your work culture. 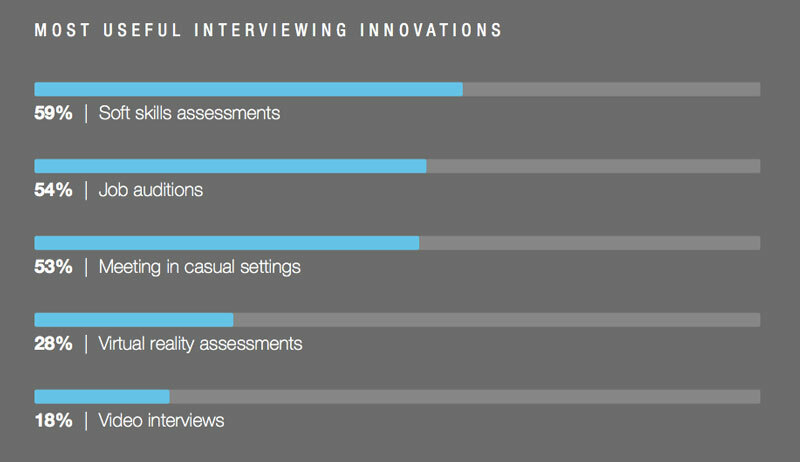 And unlike the other innovations on this list, casual interviews are completely free and super easy—it doesn’t take any big investment or special prep. You can jump on this trend today with nothing holding you back. Virtual reality (VR) and augmented reality (AR) have been hot trends in popular culture for a few years now, so it’s no surprise that they’re making an impact in recruiting. More than just fun and games, companies increasingly use VR to measure skills, show off their culture, and appeal to younger talent—check out how eight companies use VR/AR tech in recruiting here. In many cases, recruiters use VR to attract attention at job fairs or on college campuses, but organizations like Lloyds Banking and the Commonwealth Bank of Australia (CBA) use the tech to assess decision making and problem solving skills. Video conferences are nothing new, but as technology advances, recruiters are finding new ways of integrating it into the hiring process. Of course, live video interviews let you conveniently screen remote candidates with more warmth and familiarity than a phone call, but newer tech has taken it up a notch. In “on-demand” or “one-way” video interviews, candidates record themselves answering some basic questions for 15 minutes or so. 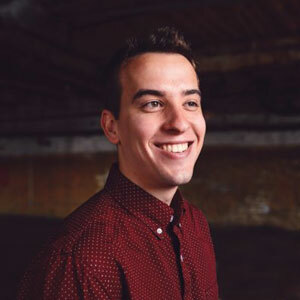 The benefits are clear: busy passive candidates can make time to record when it’s convenient for them, nervous candidates can be more at ease, and recruiters can efficiently see dozens of candidates in the space of a few hours. Video interviews are particularly useful for roles where communication and presentation are crucial—like sales, account management, and business development. KPMG Australia uses one-way video interviews to conveniently, efficiently screen a wider pool of new grads for client-facing roles. Platforms like HireVue go even further by assessing interviews automatically with AI—analyzing candidates’ voices, verbal responses, and non-verbal cues to reveal soft skills and capabilities. 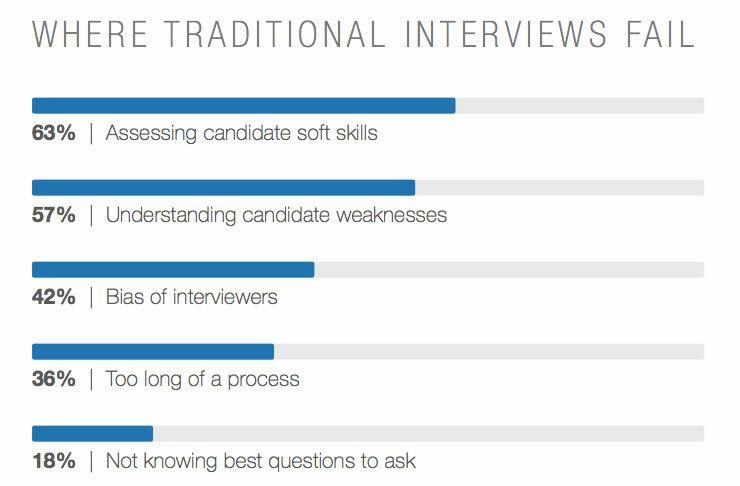 These reinventions of old-school interviewing aren’t just change for the sake of change—they’re smart uses of tech and tactics that can help you see candidates more clearly, measure skills more objectively, and make better hiring decisions. 2018 may not be the year that these interview innovations completely overtake traditional interviews—but if you’re only going old-school, you risk being left behind. A complementary, innovative approach looks to be the new normal.